Prayagraj, March 5: The Kumbh Mela, one of the largest religious gatherings in the world, held in Uttar Pradesh’s Prayagrag concluded on Monday. The last day of the mega event was commemorated on the day of Mahashivaratri, where devotees gathered to take the last Shahi Snan (the royal bath) at the Sangam- the confluence of the Ganga, Yamuna and the mythical Saraswati. Reports inform that over 1 crore devotees took the final salvation dip on the last Kumbh snan on Mahashivratri day on Monday. This brought at an end to the 49-day mega event which stated from January 15 on Makar Sakranti. Kumbh Mela 2019 Pictures From Space. Kumbh Mela Adhikari Vijay Kiran Anand was quoted by PTI saying that till Monday evening, as many as 1.10 crore devotees have taken a dip in the Sangam area. A total of six bathing dates were decided for the Kumbha Mela on the occasion of Mahashivratri 2019. Of these, shahi snaans were held on occasions of Makar Sankranti (January 15), Mauni Amawasya (February 4) and Basant Panchami (February 10). Apart from this, parv snaans was held on the occasion of Paush Poornima (January 21) and Maghi Poornima (February 19). "With Maha Shivaratri's snaan, so far more than 24.05 crore devotees have taken a dip during this year's Kumbh", he said. According to data by the UP government, the number of devotees who had taken the dip during the Kumbh stood at 22.95 crore till March 3. Kumbh Mela 2019: Who Are The Naga Sadhus and Where Do They Come From? The Kumbh Mela in Prayagraj has secured place in the Guinness Book of World Records for the largest crowd management, largest sanitation drive and largest painting exercise of public sites. The Ministry of Culture in a statement said that around 503 shuttle buses were pressed into service on the highway in one go for the team on February 28. Several people participated in a painting exercise on March 1 and 10,000 workers engaged in cleaning at the Kumbh, all performing their duties together. Kumbh Mela 2019 in Prayagraj Enters Guinness Book of World Records. On February 24, Prime Minister Narendra Modi took a holy dip in the river Ganges during the Kumbh Mela and offered his prayers at the Sangam. The Prime Minister prayed amid chanting of hymns and later offered some 'dakshina' to the priests. On February 14, BJP president Amit Shah took a holy dip at the Kumbh Mela and offered prayers. He also performed an aarti at the Triveni Ghat. Apart from the Prime Minister, several other leaders including Uttar Pradesh Chief Minister Yogi Adityanath, Maharashtra Chief Minister Devendra Fadnavis, Union Minister JP Nadda and Deputy Chief Minister of Tripura Jishnu Dev Varma also took the holy dip at the mela. Kumbh Mela 2019 Date: Know All About The History, Important Bathing Days of The Religious Gathering of Ardh Kumbh. The grand event draws lakhs of pilgrims over the course of approximately 55 auspicious days to bathe at the Sangam. It is celebrated four times over a course of 12 years. In 2019, the Kumbh was spread over 3,200 hectare land in Sangam city and witnessed the use of innovative technologies for security. Kumbh Mela 2019: 300 Hi-Tech Huts With Modern Gadgets Set Up in Prayagraj; See Pics. A modern integrated command-and-control centre was set up for 24-hour monitoring through 1,200 CCTV cameras. 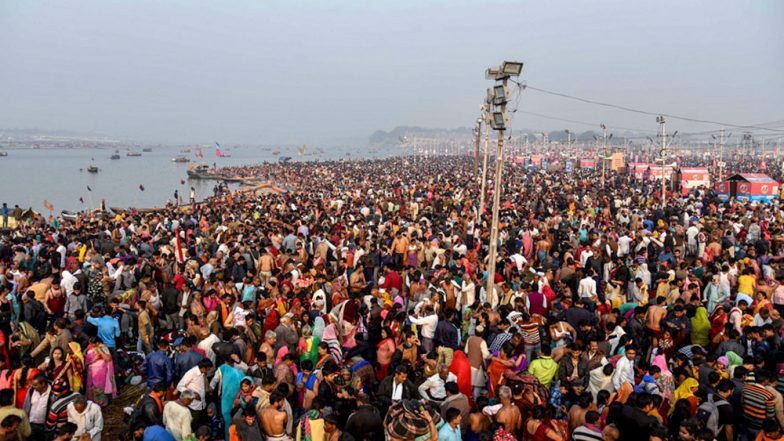 Moreover, the Kumbh also witnessed a real-time video analytics for crowd management, real-time detection and alert algorithm in overcrowding circumstances and detection of uni or bi-directional and wrong-way movements. Kumbh Mela 2019: Water Ambulances Equipped With ICU and Child Delivery Facility Set Up in Prayagraj; See Pics. Reports inform that as many as 40 fire stations were set up in and around the venue and over 4,000 fire hydrants, 70 high-pressure water mist motorcycles and trolley-mounted high-pressure extinguishers were provided in addition to the presence of National Disaster Response Force (NDRF) and State Disaster Response Force (SDRF) teams, Singh said.